On November 25, the Ukrainian ships “Berdyansk,” “Nikopol” and “Yany Kapu,” en route from Odessa to Mariupol through the Kerch Strait, were detained by officers of the Federal Security Service of the Russian Federation. During the detention, Russian border guards used life-threatening violence. As a result, the coast guard boat of the Russian Federation rammed a Ukrainian tug. 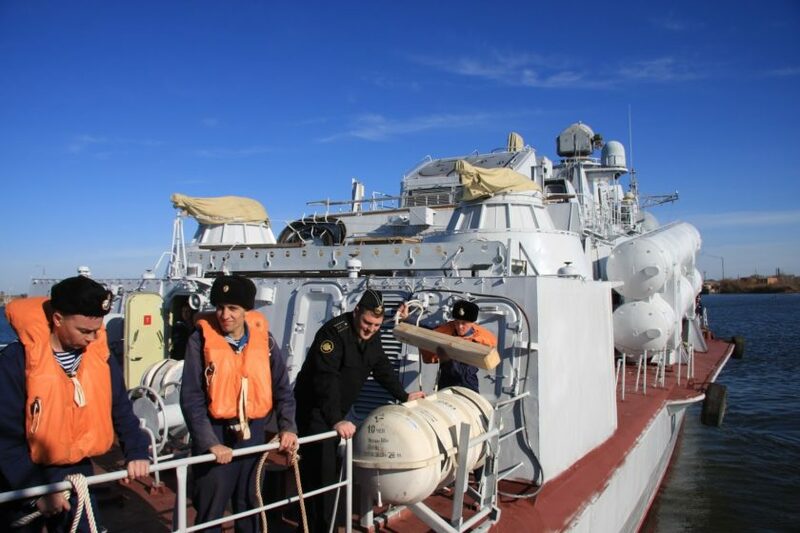 According to the Ukrainian Navy, six Ukrainian seamen were wounded, all three Ukrainian vessels were seized together with a crew of 23 people and taken to the port of Kerch, located on the territory of the occupied Crimea on the Crimean Peninsula. Later, a Spokesman for the President of the Russian Federation announced the opening of criminal proceedings against detained sailors on charges of illegally crossing the border. This incident became a turning point in the Azov conflict, which has been mounting over the past few months between the two countries. After the opening of the Kerch bridge, which established the road transport connection between Russia and the occupied Crimea, the Russian side strengthened its military presence in the waters of the Sea of Azov and complicated the passage of Ukrainian ships, despite the existing international treaties ensuring unhindered access of the two countries to their ports. Arbitrary detentions of Ukrainian ships, as well as the emergence of new military equipment, were regarded by many Ukrainian and international experts as a deliberate escalation of the conflict, culminating in the events of November 25. It is important to note that the collision in the waters of the Azov Sea was the first case of open aggression of Russia against Ukraine. Despite the fact that the armed conflict between the parties began in 2014 with the illegal annexation of Crimea, and then developed in the form of military actions in the territory of Donbass, earlier Russia did not commit acts of military aggression against Ukraine under its own flag. Andreas Umland, a German political analyst, an expert of the Euro-Atlantic Cooperation Institute specializing in Russian ultra-nationalism and authoritarianism identifies three possible reasons why such an escalation could occur right now. The first and most common version is a decrease in Putin’s rating and the need to divert attention from socio-economic problems with yet another demonstration of power. The second possible reason is the probability of the existence of the project on turning the Sea of Azov into the inner Russian sea and the desire to negatively affect the Ukrainian economy by the blockade of ports in Berdyansk and Mariupol. And the third possible reason concerns the news that the construction of the brand-new Kerch Bridge is allegedly shifted. Accordingly, a new attack could have been undertaken in order to divert attention from the news damaging the reputation of the Russian authorities. Mikhail Gonchar, director of the Centre for Global Studies “Strategy XXI”, adds that the situation should be looked at much wider than just the conflict between the two neighboring countries. Russia claims the leading world position and in every way demonstrates to the west its strength, checking the limits of what is permitted. In addition to the Ukraine and Syria cases, as well as the case of Skripals, Mikhail also cites a recent example of failures in the GPS navigation system in Norway and Finland, which resulted in that the Norwegian frigate rammed the Finnish tanker during NATO exercises in Norway. According to the Presidents of both countries, the reason was the deliberate creation of GPS-interference from the Russian side. Mikhail Gonchar claims that Ukraine in this chain of events is just an element of a more global policy of Russia’s aggression against the West. Further Russia goes, the more cynically and shamelessly it lies. Despite the open attack on the sea vessels of Ukraine, the ram of one of them, the opening of fire against members of the Ukrainian vessels crews, and the detention of these crews, Russia accused Ukraine of provocation and violation of the state borders of the Russian Federation and initiated an emergency session of the UN Security Council, which indeed took place on November 26. However, the members of the UN Security Council rejected the wording proposed by Russia and the session was held in accordance with the agenda proposed by the Ambassador of Ukraine to the UN. The member states of the UN Security Council expressed their deepest concern about the events and called on Russia to immediately release the detained Ukrainian sailors and return the vessels to Ukraine. The NATO Secretary General, as well as the President of the OSCE Parliamentary Assembly, expressed their full support for the territorial integrity and sovereignty of Ukraine. The International Monetary Fund, in turn, said that it would not stop cooperating with Ukraine even if martial law was introduced. There is no doubt that the actions of Russia fall under the definition of aggression, stipulated in Art. 3 of United Nations General Assembly Resolution 3314 (XXIX) adopted on December 14, 1974 (paragraphs “a” “c” and “d”). By its actions, the Russian side violated the basic principles of the United Nations concerning the non-use of force or the threat of force in international relations. The provisions of Section 2 of the UN Convention on the Law of the Sea, as well as Art. 2 of the Treaty between Russia and Ukraine on cooperation in the use of the Sea of Azov and the Kerch Strait in 2003 were also violated. However, since the Russian Federation is a permanent member of the UN Security Council and has the right to veto its decisions, bringing Russia to justice becomes a rather difficult task. Nonetheless, other UN member states have the legal tools for a peaceful resolution of the current situation in the framework of existing international law. However, this would require extraordinary efforts and the development of new approaches that have not yet been applied in international practice. It is entirely possible, under rule 9, to convene an emergency session of the UN General Assembly. In that case, if the GA recognizes the fact of a material violation of the basic UN principles and the fact that Russia is a party to the conflict, then guided by paragraph 3 of Art. 27 of the UN Charter and the principle “in propria causa nemo judex” the Russian side would be obliged to abstain from voting in the Security Council on the issue of resolving this dispute. It is worth noting that according to the definition of the Geneva Convention on the Treatment of Prisoners of War, 23 detained Ukrainian sailors fall under the status of prisoners of war and should be subject to the rule that “no physical or moral torture or any other coercive measures” can be applied to them. At the same time, at the moment the detainees are in the status of suspects who have allegedly committed a criminal offense and, most likely, are subjected to cruel, degrading and inhuman treatment. Even though there are still unused international legal means in the arsenal of Ukraine, many experts question their effectiveness in comparison with economic tools. Mikhail Gonchar believes that the so-called collective West has to take decisive consolidated actions necessary in order to break the chain of illegal actions of Russia both in regard to Ukraine and in relation to the entire Western world. Both Gonchar and Umland see the most realistic response to the current situation in the suspension of the construction of the Nord Stream 2 gas pipeline being built from Russia to Germany, as well as the second thread of the Turkish Stream. As for the actions of Ukraine itself, in addition to international legal instruments, it has taken unprecedented measures to ensure internal security. On November 25, 2018, the President of Ukraine convened the National Security and Defense Council, which took the initiative of imposing martial law throughout Ukraine. On November 26, a presidential decree on imposing martial law was approved by the Verkhovna Rada of Ukraine. On November 25, 2018, the President of Ukraine convened the National Security and Defense Council, which took the initiative of imposing martial law throughout Ukraine. For the presidential decree on the introduction of martial law to enter into force, its approval by the Verkhovna Rada of Ukraine is necessary. The legal framework of the martial law is settled by International Humanitarian Law and the Law of Ukraine On the Legal Regime of Martial Law. Martial law implies a significant expansion of the powers of state bodies, simultaneously with a significant restriction of civil rights. The restriction of the rights of persons present on the territory of Ukraine may concern almost all spheres of public life (property rights, freedom of movement, political rights, etc.). However, the text of the presidential decree introduces only a small part of the measures on martial law, whether this list will expand we will see in the future. The validity of such emergency measures throughout the territory raises serious doubts. Special attention should be paid to the clause on a direct prohibition of elections for the period of martial law, which, given the first version of the presidential decree, meant that presidential elections already scheduled for March 31, 2019 could be delayed by at least one month. However, after a decisive protest of the deputies of the Verkhovna Rada, Petro Poroshenko changed his decision and shortened the period of martial law to one month, as well as narrowed the geography of its application to several regions. Thus, the decree approved by the Verkhovna Rada introduces martial law in 10 regions of Ukraine from 9:00 on November 28, 2018 for 30 days to 9:00 on December 27, 2018 (the final version of the document as of November 27, 2018 has not yet been published). The President also instructed the Administration of the State Border Service of Ukraine to strengthen the protection of the state border with the Russian Federation and the administrative border with the Autonomous Republic of Crimea, and the Security Service of Ukraine to take measures to strengthen the counter-intelligence, counter-terrorism and counter-sabotage regime. The essence and limits of these measures are not yet clear; it is the responsibility of the authorities to determine this. Apart from that, the Decree contains a secret part (paragraph 12) closed for the public. As of November 27, 2108, there were no additional restrictions imposed on persons present on the territory of Ukraine regarding their movement and stay inside the country, as well as the border crossing regime. The administration of the Boryspil airport has officially stated that the adoption of martial law will not affect the mobility of the population, and the airport will operate in a normal regime.